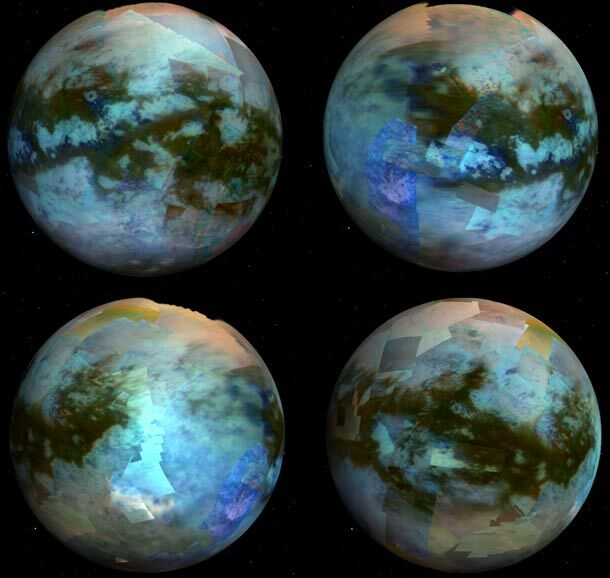 A hidden world revealed: Titan. We’ve sent space probes to every planet in our solar system (and if you’re a die-hard Pluto fan, you only have to wait 4 more years). And yet there is still much to see, much to explore. Not every world gives up its secrets easily, and perhaps none has been so difficult to probe than Titan, Saturn’s largest moon. Bigger than Mercury, second only to Jupiter’s Ganymede, Titan has an atmosphere of nitrogen so thick it has twice the Earth’s air pressure at its surface. In this false-color map, what’s shown as blue is actually light at a wavelength of 1.27 microns — very roughly twice the wavelength the human eye can detect. Green is 2 microns, and red is 5 microns, well out into the infrared. When the final images are combined, what show up as brown regions near the equator are actually vast dune fields, grains of frozen hydrocarbons rolling across the plains in the relentless Titanian winds. White areas are elevated terrain. Near the north pole, only barely visible, are smudges on the map that have been shown to be lakes — literally, giant lakes of liquid methane! So Titan has air, lakes, and weather. Sound familiar? It’s not exactly Earth-like, since the temperature there is roughly -180°C (-300°F), but the similarities are compelling. And Titan is loaded with organic compounds like methane, ethane, and more. A complex chemistry is certainly possible there, but complex enough to have formed life? No one knows. Just a few years ago I don’t think anyone would’ve taken the possibility seriously, but now… well, I wouldn’t rule it out. Remember, these maps only show global features, and even though Cassini dropped the Huygens probe onto the surface, it saw a tiny fraction of what there is to see on this moon, which boasts over 80 million square kilometers of territory. That’s a lot of land. What else is there to find there? 2 Comentários A hidden world revealed: Titan. I am not going to doubt the sincerity of this research. The world was changed by the European discovery of the new world. Lots of things happened. But Columbus sailing his boats across the Atlantic caused the Little Ice Age in Europe? I think it goes to show how we just don’t understand everything about the global weather and how it acts over the long term yet.